The Huawei Mate 20 Pro pushed the boat out with three cameras on the rear in the square arrangement you can see above, but a new patent suggests the company may be including an extra two on its next Mate phone. A patent filed by Huawei and submitted to the CNIPA (China National Intellectual Property Administration) has been published and shows a much larger cutout for a camera array on the back of the phone. Looking at the images, it seems to be longer rather than wider, suggesting there's extra space for two more cameras, bringing the total to five. There would then likely be a flash taking up the sixth space to make it a rectangle. As this is just a patent (spotted by Mobielkopen) there's no guarantee that this will be the actual setup on the Mate 30 Pro when you can eventually buy it, but it would make sense that this would be the look of the phone if the company wanted to include additional lenses. We don't have any information on the selfie camera yet, but we'd expect that to have at least one camera like on the Mate 20 Pro. We won't know anything for sure for a long time either as we currently don't expect to hear about the Huawei Mate 30 Pro until the last few months of 2019. It's likely we'll hear about it in October this year, or maybe even a bit later. We're expecting to hear about the company's flagship Huawei P30 Pro before that happens - at the moment rumors suggest that will be landing at or around Mobile World Congress at the end of February. 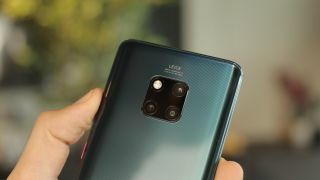 Current rumors suggest the Huawei P30 will sport three cameras like the Mate 20 Pro, while the P30 Pro may up that to four.